Join us For Happy Hour & Pool In Tempe! Everyday from 3:00pm to 6:00pm - FREE POOL. $2.25 Domestic Bottles and Well Drinks. Featuring a full cocktail lounge, finger foods, video games, pinball machines and 16 pool tables. 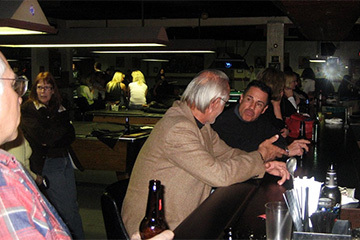 The regular patrons here are warm and welcoming people, so venture on in make some new friends and enjoy our cheap pool, great beer and Well Drink specials. A couple Pool Leagues meet here at Q and Brew. Check out the action when AZPL & APA are here. The best place in Tempe for cheap beer, cheap pool and a wonderful group of people waiting to greet you. Venture on in and leave your stress behind. Plus you can play our 9-foot Brunswick Gold Crowns 12pm to 6pm for $4 per player or $4 per player from 6pm to close. You can play all day and night for $8 per player. "Been coming here for the past 3 or 4 years now. Every time has been fantastic, have always had a great time. Weekends are the best, "Ma" as my group of friends call her, is always sweet, and friendly! She knows her regulars! The atmosphere is fantastic, never encountered a fight, and the other patrons are always nice. Great place, a well kept secret, and had placed in New Times for the past two years. Love this place." "This is such a great pool hall. It is just 3 dollars to play on any 9 foot table, and it is not hourly or anything like that. It is just 3 dollars. They will even take the side off of a bar table for the same price if you prefer that. They keep up on their tables more than you might thank as well. The service is great. The bartenders are absolutely wonderful. Immediate, accurate, and polite service every time I have went here." "How can a bar like this be in the same town for over 40 years and still be a secret? I like it that way! So let's keep this between you and me ! I like this bar because of the friendly community of customers and bartenders, the great happy hour and pool specials. The tables, people and drinks are all good!! The "Q" is usually only found by word of mouth, by the lost, or by the adventurous and it's in the same plaza as the Yucca Tap Room !!!!! Love those train tracks that run behind the building! It all spells Great Dive to me !!!! And remember, it's OUR secret !!!" "Great divey pool hall!! Awesome staff and good tables. Locals are great." 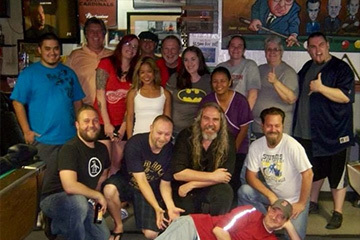 Tempe's Hottest Spot for Billiards and Brew. Best Place To Play Pool in Tempe. Free Pool In Tempe.